A friend of mine recently got herself a little surprise: Pregnant! Amazing how life can throw you some serious curve balls when you sure as hell aren’t expecting them. Her theme? Mad Hatter Tea Party. Hrm. I had never seen Alice and Wonderland nor read the book. The closest I’d come was seeing Tom Petty’s video for “Don’t Come Around Here No More” over and over again back in the 80s. I knew most of the basic themes like the Queen of Hearts, the Mad Hatter and his tea, something about a smoking caterpillar on a mushroom, the White Rabbit and something about pills making you larger and smaller (the last bit thanks to Jefferson Airplane and The Matrix). So thanks to Netflix’s on-demand service I finally saw Alice and Wonderland to get some more clues. Not the original Disney animated version (I think Netflix and Disney are having a spat), but something from 1999 with Martin Short as the Mad Hatter and what’s-her-name from Napoleon Dynamite and Big Love as Alice. (Let me tell you, what an odd, confusing story. More like a bad dream you have after a spicy dinner. But that’s another topic for another time.) 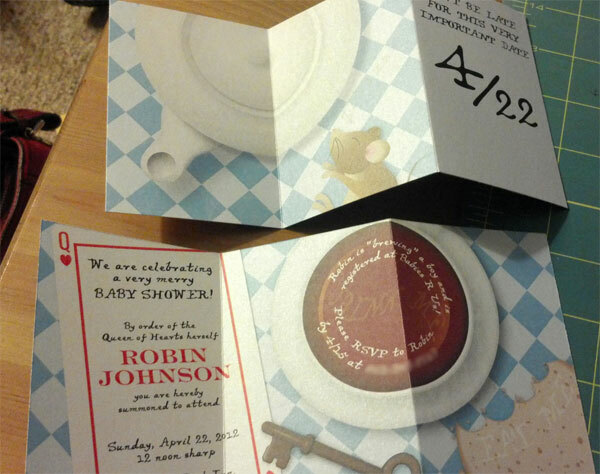 I also looked online for some existing Alice-themed invitation ideas for both what to do and what had already been done to death (so I could avoid it). That mostly helped me out with some of the wording. 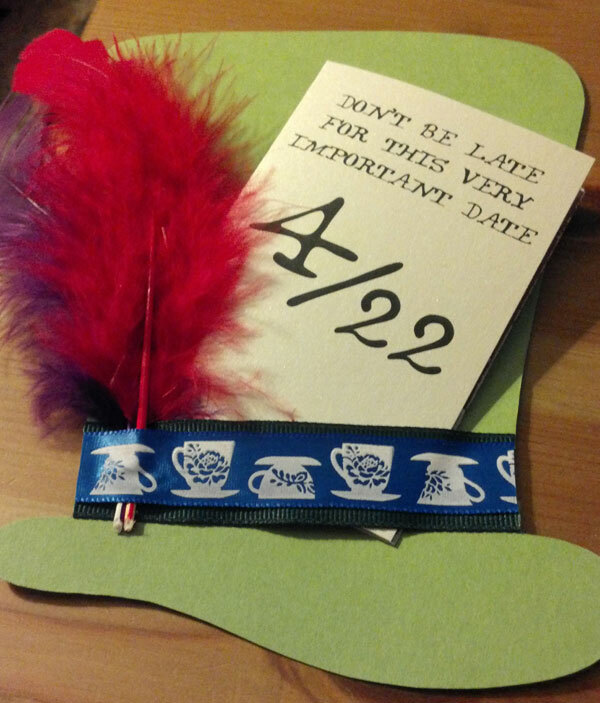 In the end, I decided to make a cutout of the Mad Hatter’s hat with the invitation itself tucked into the ribbon sash to look like his ‘In This Style 10/6’ tag. I have a TON of green paper leftover from my wedding invitation that I didn’t use, and the shade happened to match the Mad Hatter’s hat from the original Disney movie. Bonus! I happened to find ribbon at a craft store with printed tea cups on it, so that was perfect. I also tucked feathers into the sash for added color, texture and whimsy. The invitation is a z-fold on a white pearlescent card stock with all the info on the inside spread, plus some added panels on the back to include some extra Alice-related items. Forgive the crappy cell phone shots, I just wanted to share the finished product with the world. More official photos will be taken at some point for future inclusion in the crafty section of my portfolio. The favors will be small tea-infused soaps. Every guest will get three: one chamomile, one earl gray and one green tea. They will each be in their own faux teabag, complete with tag (courtesy of the “White Rabbit Tea Company”) and presented in a small wooden box which I will give a blue-hued white-wash and affix a black and white harlequin ribbon. More to come. The invites are gorgeous…and you are funny! Congrats to Robin!